Kelly’s personality is somewhat of a mystery. He was born Edward Talbot in Worcester and attended Oxford for a few years, but did not obtain a degree. He seems to have practiced as a notary for a number of years in London or Lancaster. In Wales he appears to have chanced upon, under rather mysterious circumstances, the sole copy of The Book of Saint Dunstan, an alchemical treatise which explains how to formulate the Red and White Powders for the Transmutation of Metals, along with two ivory caskets containing samples of these powders. He is alleged to have used these powders to make gifts of gold for his friends; and to impress John Dee. There is a poorly substantiated tradition that he wore his characteristic black skull cap to disguise the fact that his ears had been cut off for forgery. Most non-magician historians view him as a charlatan who took advantage of Dee’s credulity, leading him along with puzzling clues to arcane knowledge. And yet, Dee seems to have driven Kelly to the brink of insanity, forcing him to perform long skrying sessions on a nearly daily basis. 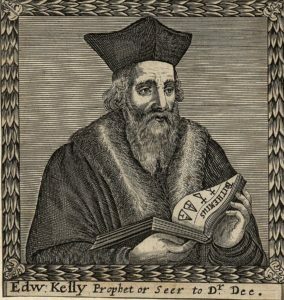 Kelly expressed his fear and mistrust of the spirits on a number of occasions. In addition, the materials received in the workings was in an Angelic language, with its own unique grammar and syntax, some of it being remarkably consistent and betraying substantial knowledge and intelligence. It is written in a strange yet magnificent sort of prophetic poetry which possesses remarkable power and dark beauty. That Jesus was not God. That no prayer ought to be made to Jesus. That there is no sin. That mans soul doth go from one body to another childes quickening or animation. That the generation of mankind from Adam and Eve, is not an History, but a writing which has another sense. No Holy Ghost they acknowledged. They would not suffer him to pray to Jesus Christ; but would rebuke him, saying, that he robbed God of his honour, etc.